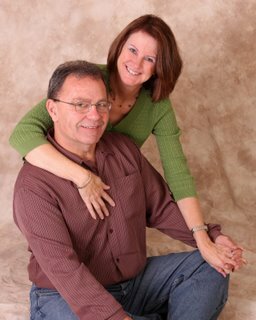 Jim and I arrived just minutes apart on Sunday Dec. 23. He was coming from Mass. and I was coming from NC. Then we went to church where Jenn had written the Christmas program for her ward. It was so beautiful. It was spiritual and full of music and love. Then we went to Jenn's for dinner along with Katie's family, Aunt Barbara, Uncle Scott, Laura their daughter and Helaina's family. We ate played games and had a good evening. Jenn and Katie made a Turduckin. That is a turkey with a duck and chicken inside. It was amazing. The next day was Christmas eve. Jenn and Eric open their gifts to each other on Christmas eve so Jim and I exchanged gifts to each other also. I received a camera and I gave him some cologne. 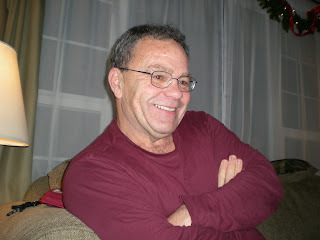 This is a picture of Jim with my new camera that he gave me for Christmas. My camera stopped working and he dropped his so we were without a camera. I am very glad to have one again. Isn't he so cute. 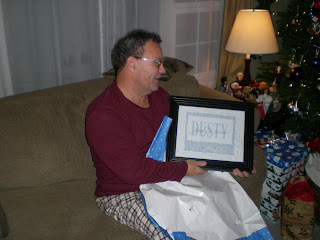 Here is him opening up the gift from Jenn it was a picture that says Dusty family is forever. He really liked it. I think he also had a great Christmas it was fun to have a man to buy stuff for and to spoil again. Playing games was fun. Sarah took a little while to come to me but not to long. Hadley came right over and gave me some loving. 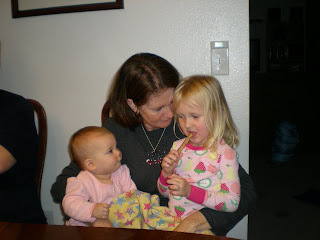 It is so fun to be with children at this time of year. 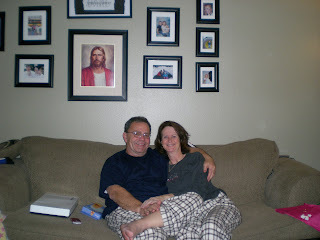 Here we are in matching PJ's of course we stayed in them all of Christmas day and just played around the house. It snowed on Christmas. That was exciting because in NC it was 68 and sunny. It just seems wrong to have Christmas when it is that hot outside. 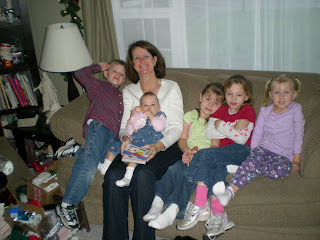 Here I am reading stories to the kids while we wait for everyone to get ready to go to OMSI on the 26th . We had so much fun there. Jenn really planned lots of fun things for us to do. It sure is nice getting snuggles from all of them. :) I can't wait to be back up there with them.